The Bubble Nebula is an emission nebula located in the northern constellation Cassiopeia. The nebula lies at a distance of 7,100 to 11,000 light years from Earth. It is also known as Caldwell 11 or Sharpless 162. Its designation in the New General Catalogue is NGC 7635. It was nicknamed the Bubble Nebula because of its shape, which was created by a strong stellar wind from a young, massive, hot Wolf-Rayet star that shed its material to form the nebula. The star has the designations SAO 20575 and BD+60 2522. The Bubble Nebula has an apparent magnitude of 10 and is about 10 light years in diameter. The central star has a magnitude of 8.71 and a mass about 44 times that of the Sun. 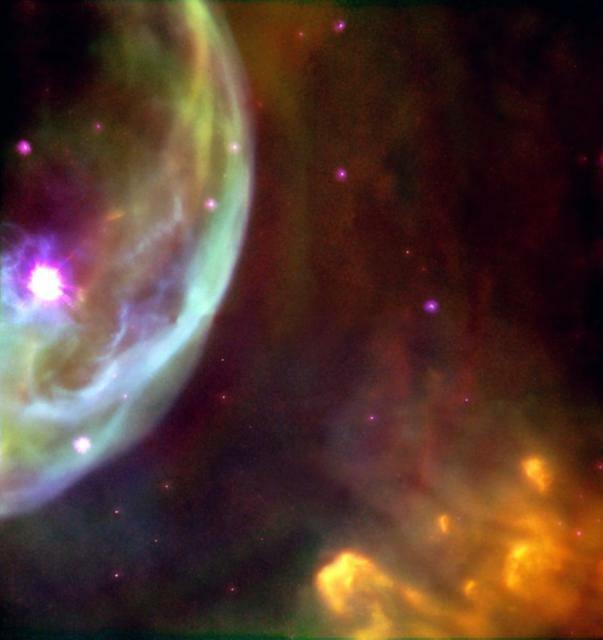 The star’s radiation ionizes the bubble-shaped shell, causing the nebula to glow. The stellar wind and radiation from the star are responsible for the nebula’s shape. NGC 7635 is located near a large molecular cloud, and lies roughly in the same direction as the open star cluster Messier 52, near the border with Cepheus constellation. The nebula can be found about 35 arcminutes to the southwest of M52. The molecular cloud contains the nebula’s expansion and is itself illuminated by the glow of the nebula’s hot central star. 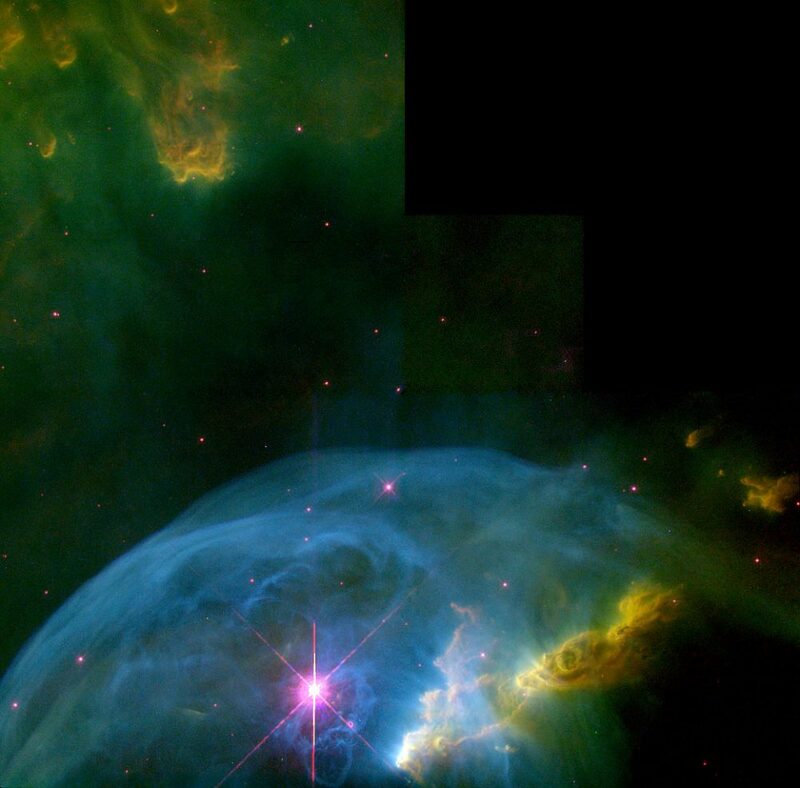 The Bubble Nebula was created about 300,000 years ago, when the central star expelled a shell of dust and gas. The expelled material rapidly moved away from the star and, as it interacted with the nearby molecular cloud, it began to create the nebula’s bubble shape. 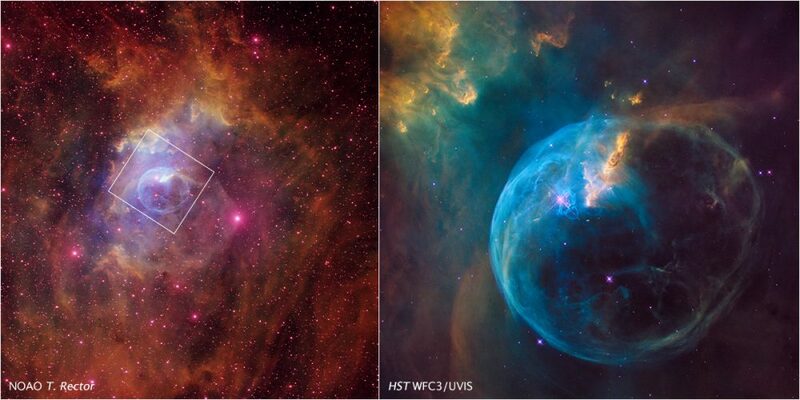 For the 26th birthday of NASA’s Hubble Space Telescope, astronomers are highlighting a Hubble image of an enormous bubble being blown into space by a super-hot, massive star. The Hubble image of the Bubble Nebula, or NGC 7635, was chosen to mark the 26th anniversary of the launch of Hubble into Earth orbit by the STS-31 space shuttle crew on April 24, 1990. “As Hubble makes its 26th revolution around our home star, the sun, we celebrate the event with a spectacular image of a dynamic and exciting interaction of a young star with its environment. 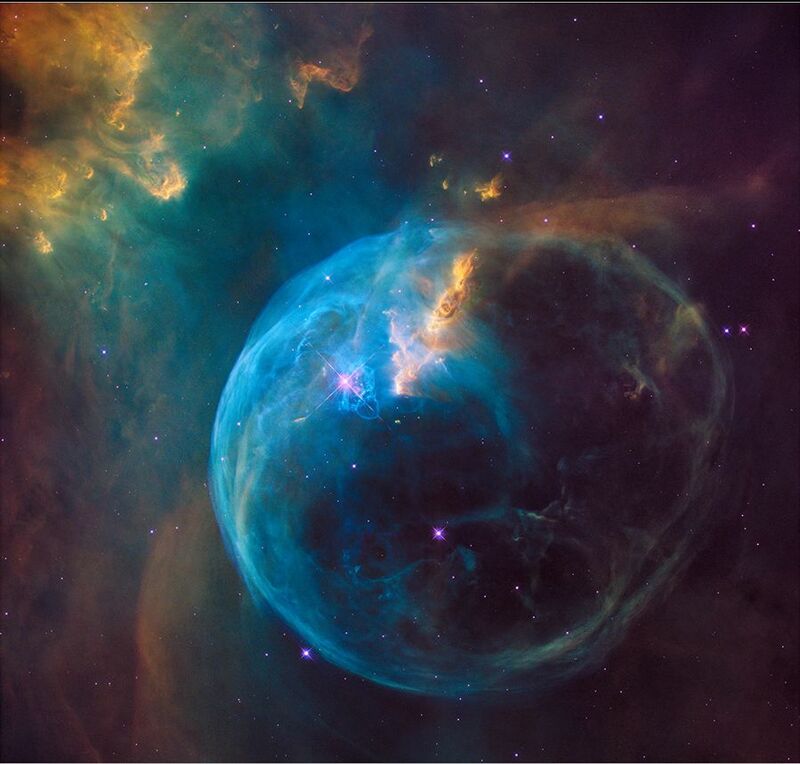 The view of the Bubble Nebula, crafted from Wide Field Camera 3 images, reminds us that Hubble gives us a front-row seat to the awe-inspiring universe we live in,” said John Grunsfeld, astronaut and associate administrator of NASA’s Science Mission Directorate at NASA Headquarters, in Washington, D.C. The Bubble Nebula is 7 light-years across — about one-and-a-half times the distance from our sun to its nearest stellar neighbor, Alpha Centauri — and resides 7,100 light-years from Earth in the constellation Cassiopeia. The seething star forming this nebula is 45 times more massive than our sun. Gas on the star gets so hot that it escapes away into space as a “stellar wind” moving at over 4 million miles per hour. This outflow sweeps up the cold, interstellar gas in front of it, forming the outer edge of the bubble much like a snowplow piles up snow in front of it as it moves forward. As the surface of the bubble’s shell expands outward, it slams into dense regions of cold gas on one side of the bubble. This asymmetry makes the star appear dramatically off-center from the bubble, with its location in the 10 o’clock position in the Hubble view. The star, SAO 20575, also continued moving through space and eventually moved away from the centre of the nebula. 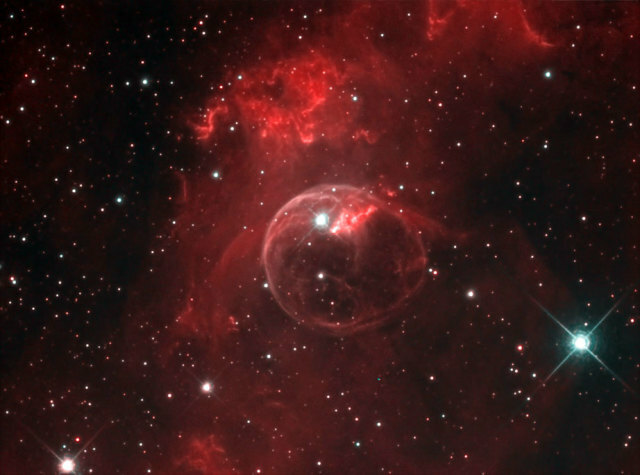 In an 8 or 10-inch telescope, the Bubble Nebula appears as a faint shell around SAO 20575. It is not an easy object to see because it has a low surface brightness. The nebula’s irregular shape can be seen in 16 or 18-inch telescopes. There are several other regions of nebulosity near the Bubble Nebula and M52, including a small, bright emission nebula and a larger emission nebula designated Sh2-157. Another large HII region, Sh2-161, also lies in the vicinity. The Bubble Nebula was discovered by William Herschel in 1787. The central star, SAO 20575, belongs to the stellar class O6.5. It has an apparent magnitude of 8.71 and and absolute magnitude of -5.5. It lies at a distance of 2.4 kiloparsecs From Earth. The star has a radius 15 times that of the Sun and is 398,000 times more luminous. Its estimated surface temperature is 37,500 K. SAO 20575 is believed to be a member of the Cas OB2 association. SAO 20575 is a Wolf-Rayet star, a class O star which will soon end its life in a supernova explosion. It has a strong stellar wind and emits an enormous amount of energy. Wolf-Rayet stars typically expel significant portions of their mass in this phase of their evolutionary cycle. They can lose as much as two thirds of their mass before exploding as supernovae. Wolf-Rayet stars are named after Charles Wolf and Georges Rayet, the French astronomers who were the first to describe their nature in 1867. There are less than 300 known Wolf-Rayet stars in the Milky Way and some have been observed in other galaxies.